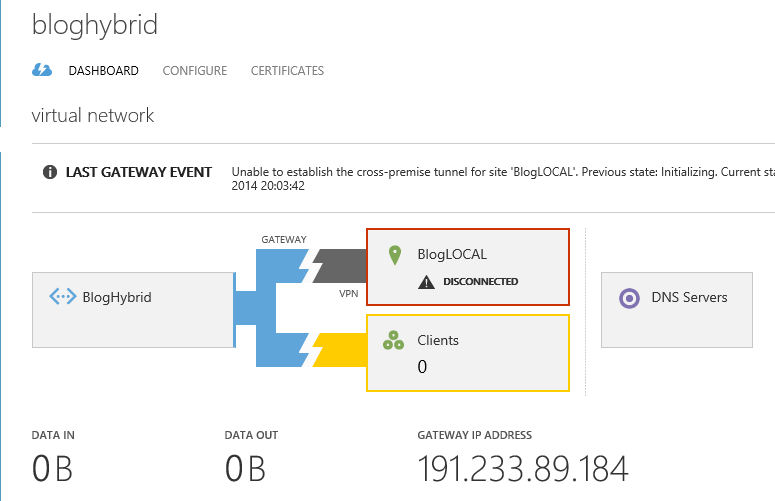 There are a lot of real good Blog post on how to create Azure Site to Site. 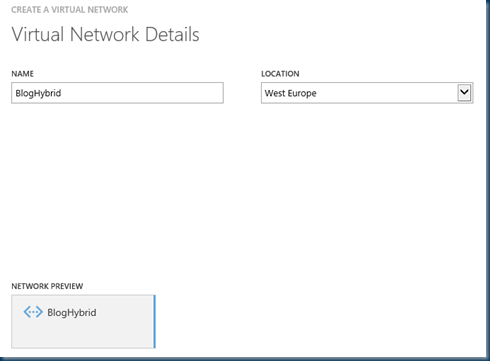 And as the Vnext Windows Server is more and more connecting to the Cloud. 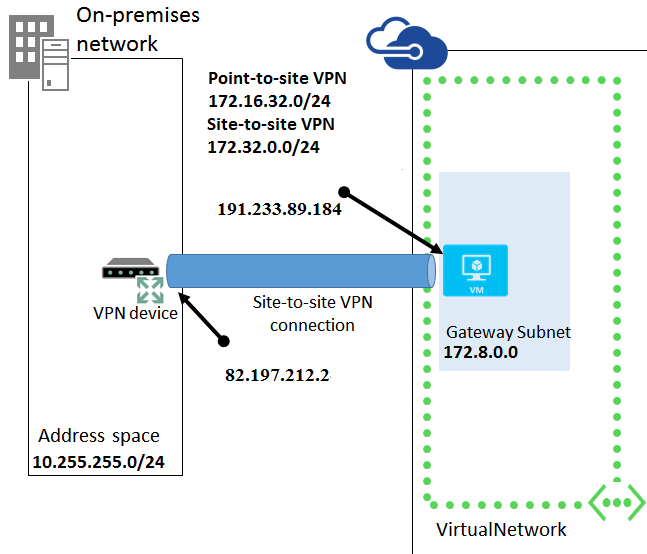 I’ll show you how to create a S2S & P2P VPN setup. 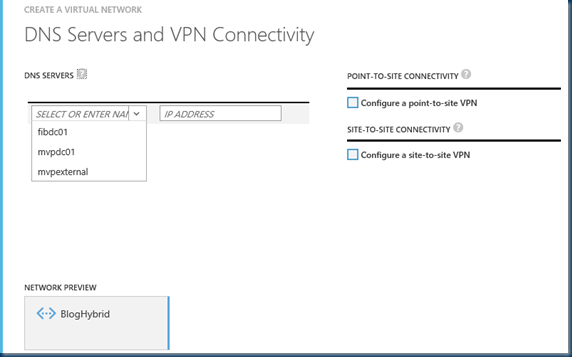 And The VPN option will get you to a real hybrid Network and This could be awesome. keep reading my blog posts. 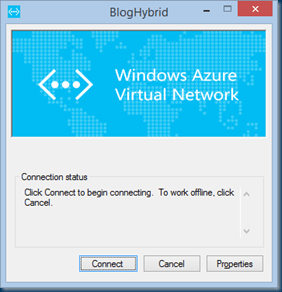 The Next blog post will be more about Hybrid Configurations. 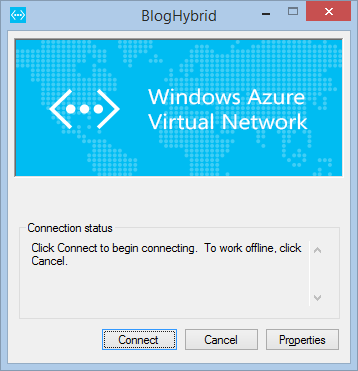 So what do we need for a hybrid Environment Well I’ll setup a poor men’s version, that means One Hyper-v server home Router and an Azure Subscription. So one NIC is on my corp network and the other NIC is connected to the friendly Internet. 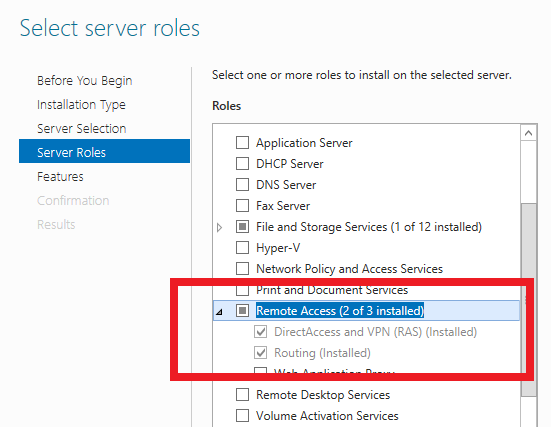 When you have the server installed you only need to install RRAS Role Service and no direct configuration needed. 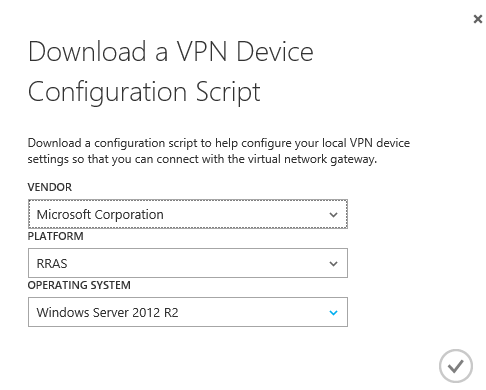 But this all depends on you network configuration. 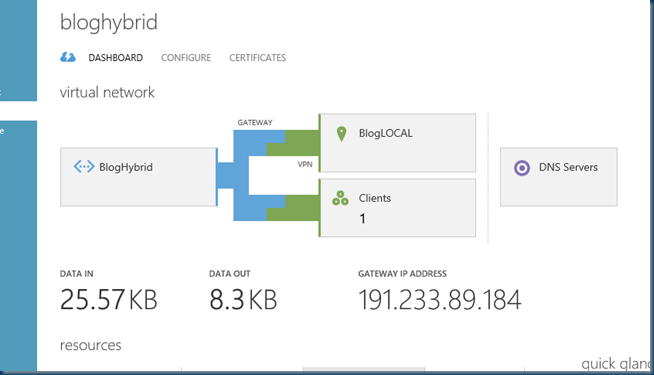 The next step is Azure . 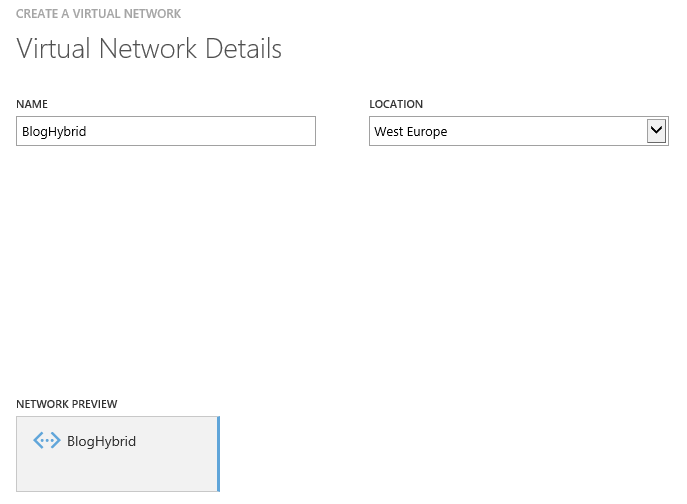 As I do net have a Network in azure I create a network that I will use for my VM’s that I will build after the network configuration, But I you already have a network in azure you can use that network. But what Do I need Well It does not mater the Quick is configurable after creating the network. And the Custom is more Wizard driven. For the screenshots I’ll pick Custom. 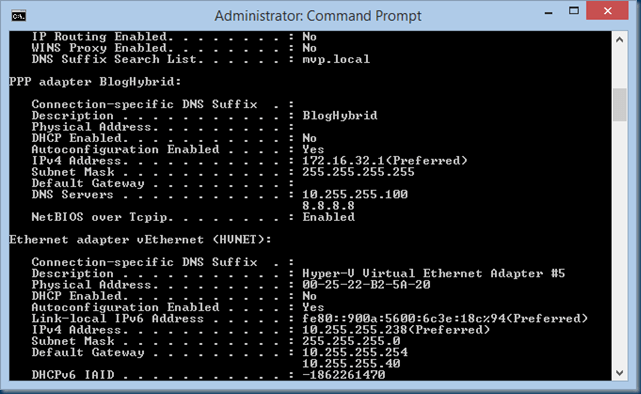 Next step is Setting Checkboxes and DNS. 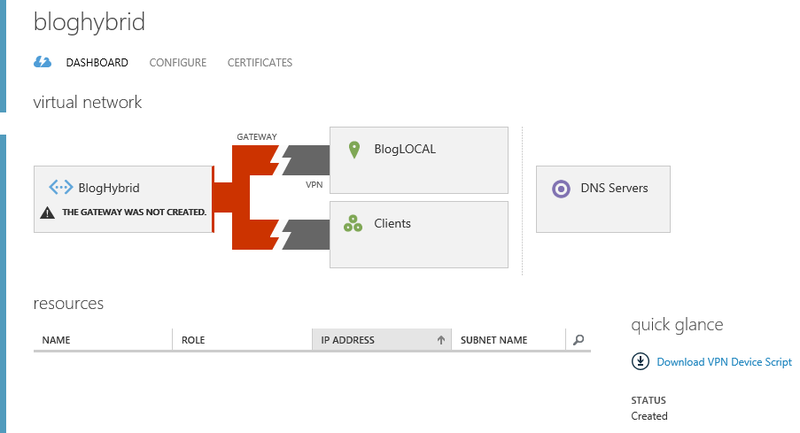 I use an on premise DNS server but If you run a DNS in Azure You can use this server. 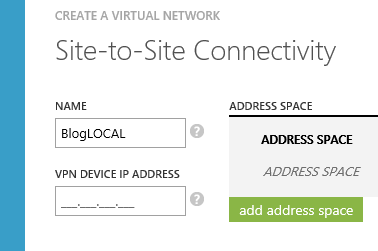 If you have already a network then you can pick the DNS servers from the list and pick also a local network. 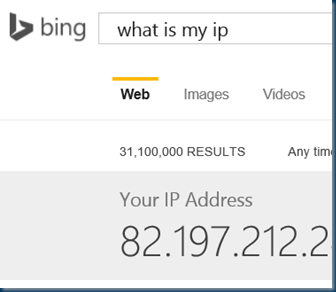 I this case everything is New So give the DNS server a name and IP this is my local DNS server and I use a Internet DNS server. 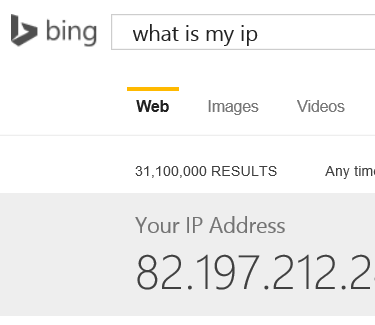 Just because this is an Easy IP address. 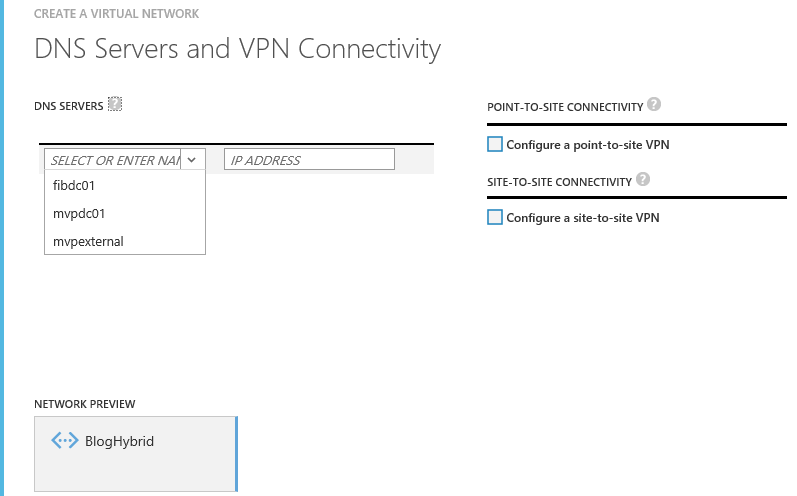 And I selected the Configure a point-to-site VPN and Configure a site-to-site VPN and on the Local Network I choose a new local network. Now that the Diagram is filled we do some configuration, As my local network is a 10 network and I like to not have this in the same range in this Scenario. 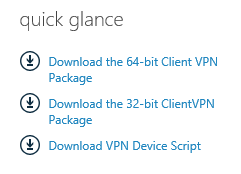 So I pick a 172.16.32.0/24 For my point-to-site VPN. The next step is more Complicated, We need to pick a Local-Network name and We need to find the External IP on you network. 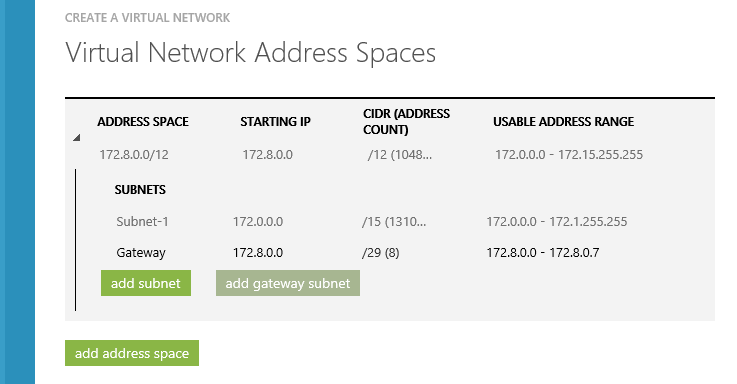 The Next step is create a Address space for this network. 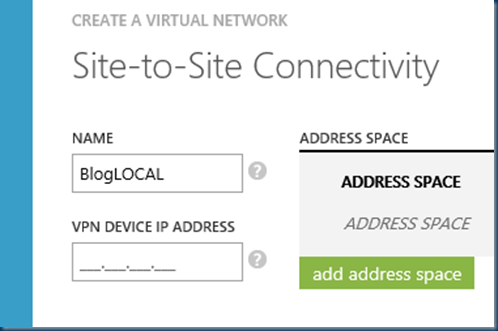 see Virtual Network Address Spaces page in About Configuring a Virtual Network using the Management Portal. 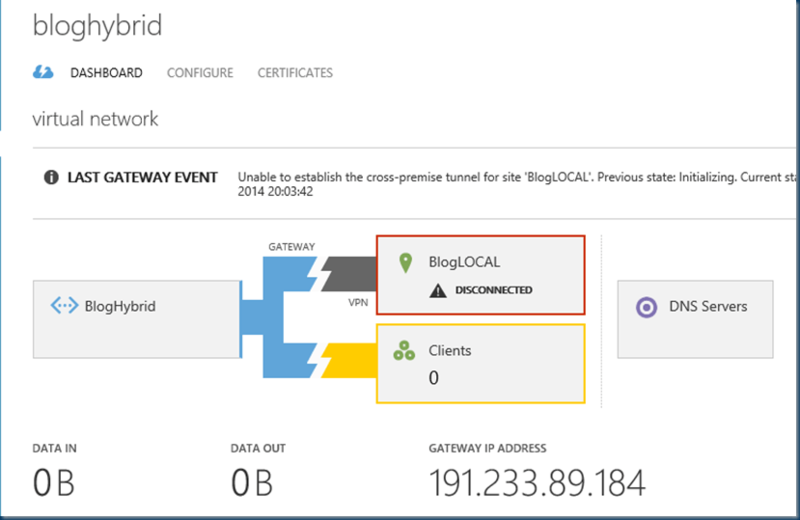 Check the Box and you can see it is creating the network configuration but not the Gateway this is done in the next step. 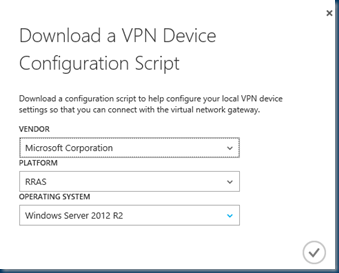 While this is creating we will configure the P2P VPN. 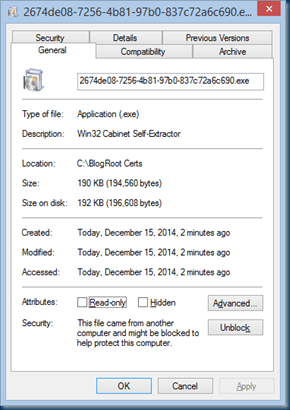 One way to create an X.509 certificate is by using the Certificate Creation Tool (makecert.exe). To use makecert, download and install Microsoft Visual Studio Express 2013 for Windows Desktop, which is free of charge. In this case I’ll use make cert. 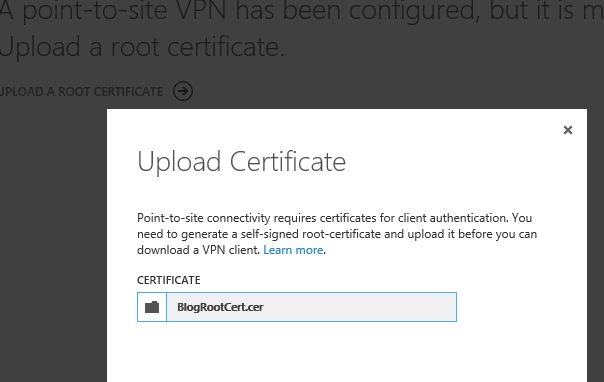 Generate a self-signed root certificate the name can be your name or what you like. 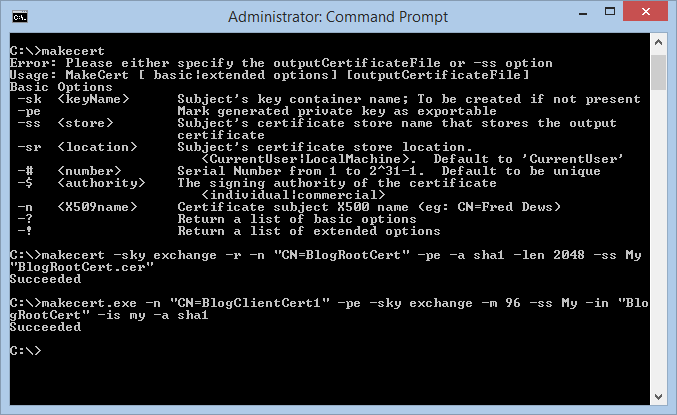 makecert -sky exchange -r -n "CN=BlogRootCert" -pe -a sha1 -len 2048 -ss My "BlogRootCert.cer"
All certificates are stored in your Personal certificate store on your computer. Check certmgr to verify. 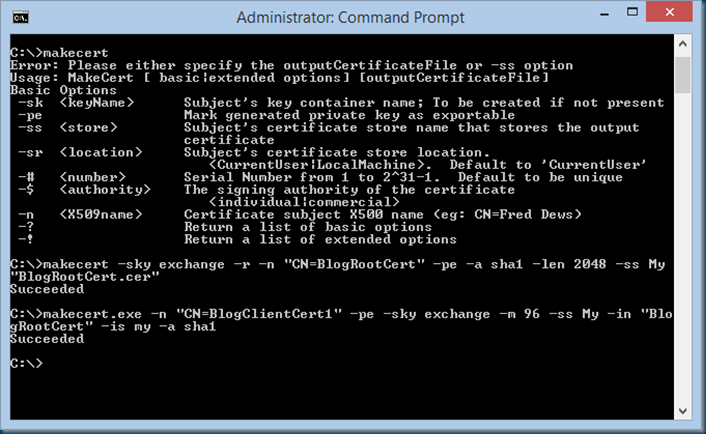 You can generate as many client certificates as needed based on this procedure. 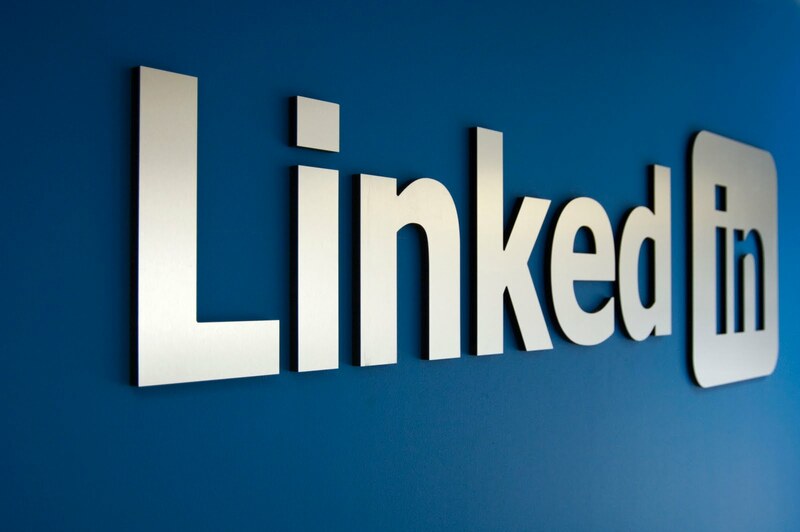 Recommend is that you create unique client certificates for each computer that you want to connect to the virtual network. 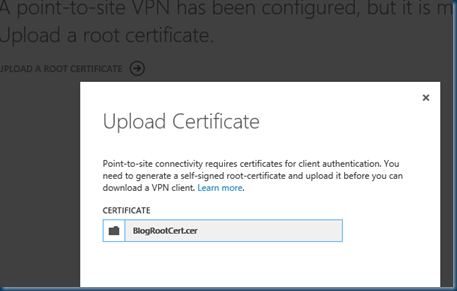 A client certificate must be installed on each computer that you want to connect to the virtual network. 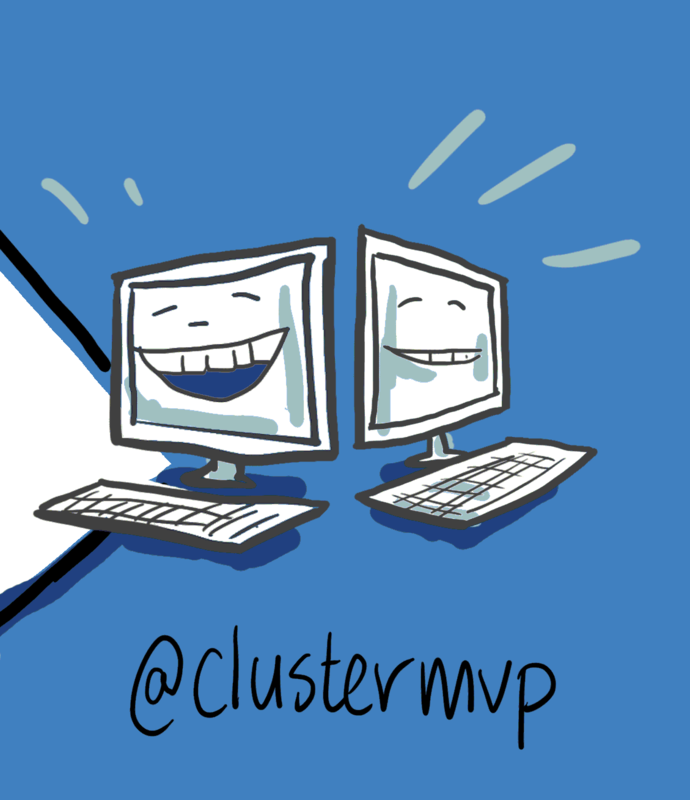 This means you will probably create multiple client certificates and then need to export them. 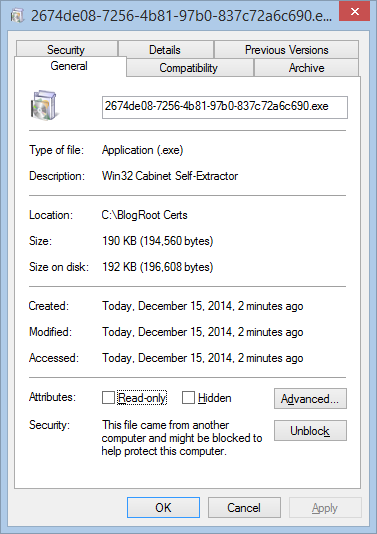 To export the client certificates, use certmgr.msc. Right click on the client certificate that you want to export, click all tasks, and then click export. 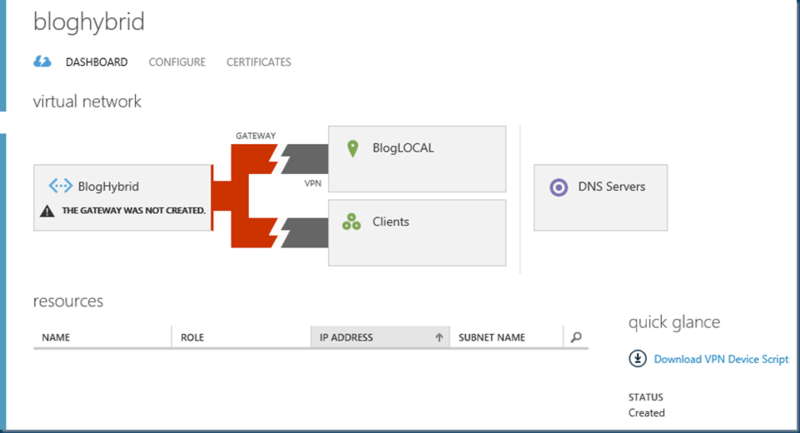 Export the client certificate with the private key. This will be a .pfx file. Make sure to record or remember the password (key) that you set for this certificate. Copy the .pfx file to the client computer. On the client computer, double-click the .pfx file in order to install it. Enter the password when requested. Do not modify the installation location. 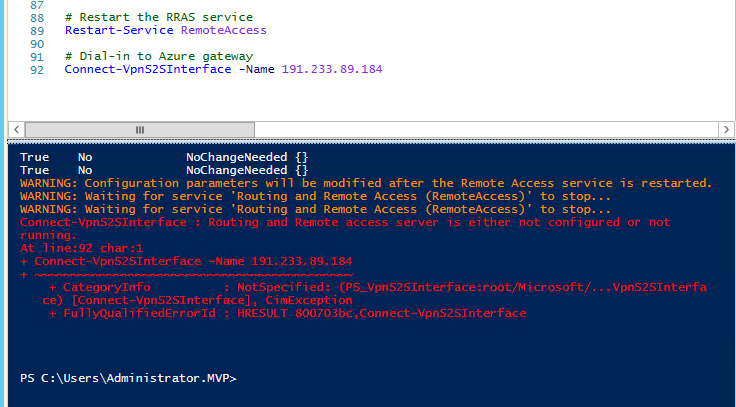 Now that all the Azure Configuration is Done We configure the RRAS server as you can see in the overview the Gateway and P2P VPN is not Connected. 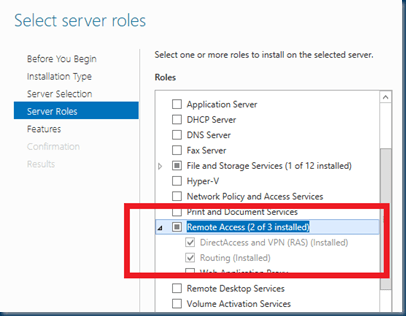 Just make sure You select the Windows Server 2012 R2 as we are using this for the gateway. 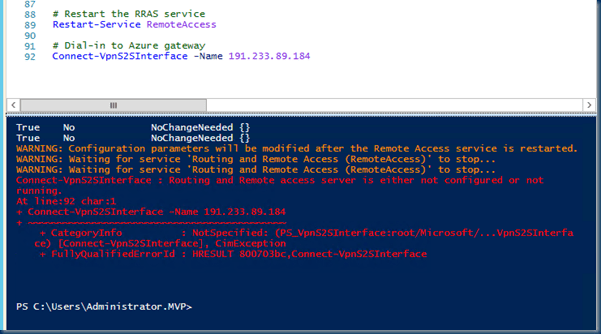 When running this script in the RRAS server there is a Common Error the RRAS service is restarted so therefor it can not connect just run the connect line again and it will work. However this is a CFG script you can rename this to PS1 Or Run this in Powershell ISE like I did. 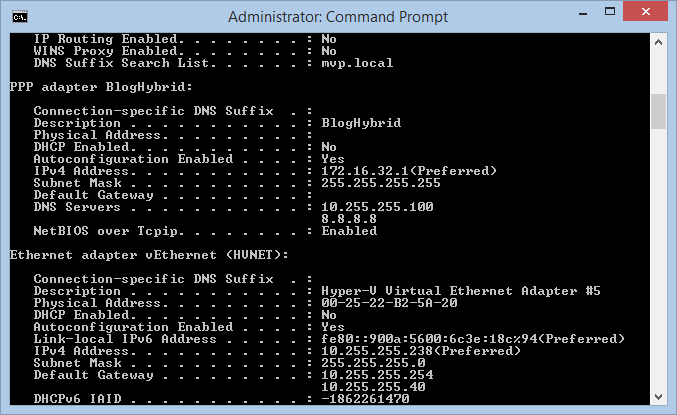 Now that the File is unblocked we can install the VPN this is a real quick install and no screens to view but in the network You can see a new network, in this case BlogHybrid. For connecting just click the network and connect. 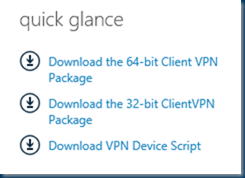 As you can see I’m connected With point-to-site VPN and a site-to-site VPN. 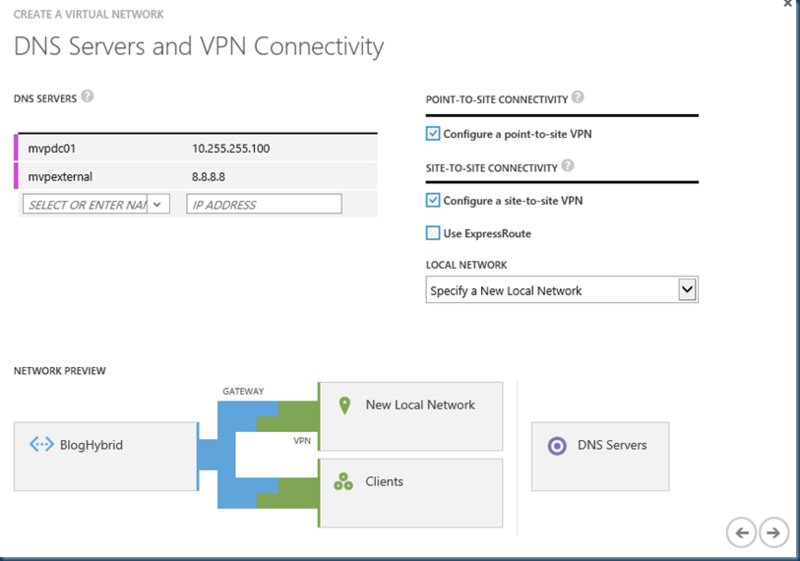 With a site-to-site VPN I can use Windows Azure Servers connecting To my local Domain. With point-to-site VPN I can Connect With a Windows Azure VM on the Internal IP without using the VNname.cloudapp.net IP. This Will be the basic’s for my next Blog post Azure is very useful for easy testing an getting a heavy machine for your workload even for one day.